In this article Seattle Prosthodontist, Dr. Alexander Shor answers frequently asked questions about Full Mouth Reconstruction. To see Before and After Examples completed in our office please scroll to the bottom of the page. 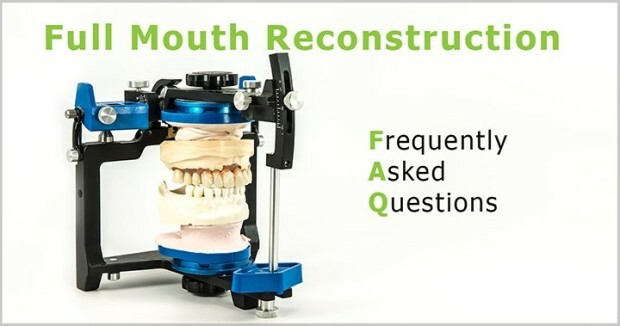 What is Full Mouth Reconstruction / Full Mouth Restoration? Full mouth reconstruction (also called Full Mouth Restoration or Full Mouth Rehabilitation) is a dental treatment which includes restoration and/or replacement of all or most the teeth by means of artificial restorations. Full mouth reconstruction is a complex treatment which requires advanced planning, design, execution, and often inter-disciplinary care in order to achieve objectives of the treatment. What are the Objectives / Goals of Full Mouth Reconstruction? Depending on patient’s condition, full mouth reconstruction may include number of objectives. Below is the list of most common treatment goals. Numerous broken, lost and diseased teeth almost always negatively impacts patient’s social interaction, well-being and quality of life. The global goals of full mouth reconstruction include improvement of the above aspects of patient’s life. What are the Most Common Diseases and Conditions Which May Require Full Mouth Reconstruction? A number of diseases and conditions can wreck severe damage to the teeth or result in missing teeth. Below is the list of most common conditions and diseases, which when present in severe form may require full mouth reconstruction treatment. What are the Most Common Dental Restorations Used in Full Mouth Reconstruction? Below is the list of most common dental restorations which are used in full mouth reconstruction treatment. What is Treatment Process and Treatment Time of Full Mouth Reconstruction? Full mouth reconstruction treatment is completely customized to each patient’s individual needs. Overall the whole treatment is typically divided in several stages. In the initial evaluation and planning stage your dentist / prosthodontist will develop a customize treatment plan which takes into account your desires, condition of your mouth and cost requirements. During active treatment stage, necessary procedures are performed, and in the maintenance stage patient is recall for cleanings and check ups. Treatment time of full mouth reconstruction depends on the patient’s clinical condition and may take somewhere from several month up to several years in the most demanding cases. It is not uncommon that patients who undergo full mouth reconstruction treatment may require a large number of dental appointments. Full mouth reconstruction treatment is a commitment on the patient’s part in terms of time. However your treatment can be staged in such manner that it minimally interferes with your schedule. How Long the Dental Restorations Last? It is a great question. Many dental restorations show longevity in a range of one to several decades. However it is impossible to give accurate estimates without analysis and knowledge of your unique condition, present risks factors and type of restorations you may require. Bear in mind that condition of your health and mouth may change over time and this may also impact longevity of the restorations. What is the Cost of Full Mouth Reconstruction ? The cost of full mouth reconstruction can vary considerably depending on the treatment goals, and type and number of restorations. In general full mouth reconstruction treatment is one of the most expensive dental treatments. In addition to dental restorations you may also require other dental procedures such as root canal fillings, dental surgery and etc. This can further increase the cost of treatment. One of the best way to understand the cost of treatment is to request a treatment cost estimate at the planning stage of your full mouth reconstruction. What are the Cons of Full Mouth Reconstruction Treatment? Just like majority of medical and dental procedures full mouth reconstruction may have risks and disadvantages. Risks of full mouth reconstruction treatment vary considerably depending on your condition and chosen treatment plan. Below if the list of most common disadvantages of full mouth treatment. It is important that you learn about your options and risks early on in the planning stage of the treatment. This will help you to make a most educated decision about your treatment. Who are the Most Qualified Specialists to Perform Full Mouth Reconstruction? Prosthodontists are the most qualified specialists to perform full mouth reconstruction. Prosthodontist are dentists who receive specialty training in accredited dental school in the areas of tooth restoration and tooth replacement. In many instances full mouth reconstruction is an inter-disciplinary treatment. You may also receive care by other dental specialists such as surgeons, endodontists, orthodontists, and oral medicine specialists. Before and After. Case Examples of Full Mouth Reconstruction by Seattle Prosthodontists Drs. Alexander and Kavita Shor. Full Mouth Reconstruction with Dental Implants, Dental Crowns and Dental Bridges. At Shor Dental we would love to help you with your tooth replacement needs. Please call us to schedule your appointment and learn about your options!